Introducing the new Nano-Pak! 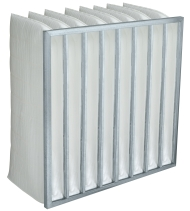 This top-of-the-line bag filter features the highest performing filtration media – delivering the lowest energy use and longest service life. Nano-Pak is a robust filter suitable for all environments and is the product of choice for customers who seek a higher performing bag and lower energy costs. Underwriters Laboratories, Inc. Classification: Nano-Pak Bag filters are classified U.L. Class 2 per U.L. Standard 900.